Baseball has a new fad that has exploded in the past few years. 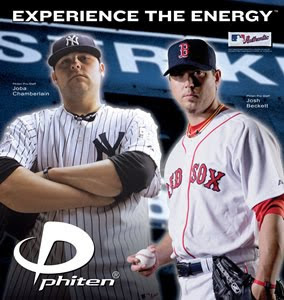 A brand named Phiten makes products that are supposed to regulate your flow of energy. With the proper flow of energy these products are supposed to help alleviate discomfort, a speedy recovery, and counteract fatigue. They were developed in Japan based on ancient movement arts that have been studied for hundreds of years. These products are said to be scientifically proven to give almost instant relief. They make necklaces, bracelets, arm sleeves, and even tape. I can almost guarantee that when you watch a major league baseball game that you see at least 3 people wearing one of their products. I have also bought these products specifically the necklace and the bracelet. I feel that the affects of these products are more mental than anything else. If you or any of your friends have played a sport like baseball you would know how superstitious most of the players are. If they have a good game wearing one of these products they won’t want to play without it. Even though I wear these products I am still a skeptic just like some doctors. Just like Dr. Orrin Sherman from NYU Hospital who says, “There’s just no way the chemical structure of the body can be influenced by magnets that small. It’s all superstitions with no scientific basis.”( scienceline.org) There is no independent research to back up the companies claim. This is why Dr. and author of The Psychology of Superstition, Stuart Vysen says, "People don't understand science all that well, so if you throw some science speak at them it sounds plausible. "( cbsnews.com) I am not saying that these products do not work. If you are interested in these products try them out, and let me know what you think. This post was very interesting, and the video helped me visualize the product a lot better. I personally feel that people will literally try anything that may possibly help their perfomances especially when it deals with sports. While it may not even work, sometimes it could just give the players a little something extra to promote courage. If they think that they can do better, it may be possible that they will. Whether it is purely all psychological or if it actually works, who cares if they are doing better right? This was an interesting post to read because over the past year or so I have noticed all these baseball players wearing those necklaces and bracelets but never knew what they were for. The fact that these guys who became talented through their own hard work think that little magnets are effecting their game is funny, even when the product is dis-proved by scientific facts. It does not surprise me that this product is so popular throughout baseball because of how notoriously superstitious most athletes are. As a baseball player, if nothing else it helps to keep your arm warm and the compression from the sleeve does make your arm feel better when your throwing. Even if the magnets don't work, it still helps.